There’s no drama quite like space drama. And Juno’s flight to Jupiter has been about as dramatic as a sci-fi thriller can get. Last October, Juno’s engine system malfunctioned, causing NASA to delay the orbiter’s planned approach into a 14-day “science orbit.” This February, NASA decided to forego the science orbit engine burn entirely, keeping the spacecraft in its much longer 53.5 day orbit. But today, we’re finally getting some good news. NASA is releasing Juno’s first scientific results, in a dump of nearly 50 papers published in the journals Science and Geophysical Research Letters today. The mission’s plan to study the crap out of the planet has managed to offer surprises wherever possible. 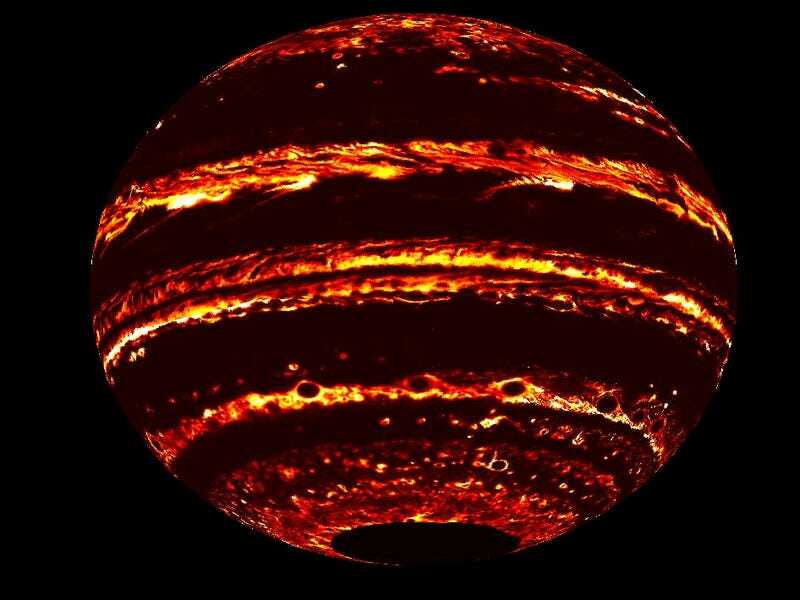 Be it the gas giant’s gravitational field, aurorae, or just the weather, Jupiter is a whole lot weirder than anyone thought it would be. Juno has a suite of instruments for measuring microwaves, infrared waves, radio waves, visible light, Jupiter’s magnetic field, and other particles. The craft’s enlongated orbit around the planet allows periodic up-close measurements, taken during “perijove” passes. 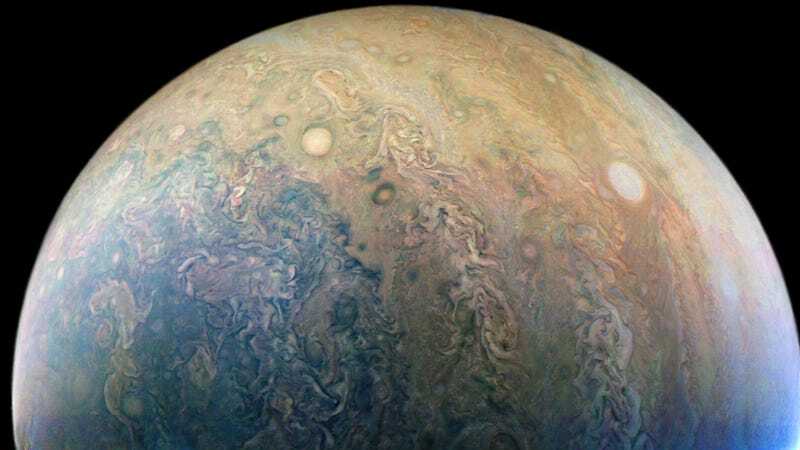 The data helps scientists understand some of Jupiter’s most important properties, including the shape of its gigantic magnetic field, how gasses are distributed inside the planet and how they move around, how much water the planet has in its atmosphere, and hopefully, the giant gassy planet’s structure all the way down to its core. The most recent analyses come from only one or two of Juno’s closest approaches, so it’s just a snippet of the total data to be collected from the mission (initially, Juno was slated to make 33 perijove passes, but following the decision to keep the spacecraft in a wider orbit, that number has been reduced). But initial observations show a gravitational field differing from scientist’s original expectations, poles with lots of clustered storms more chaotic than Saturn’s, a magnetic field twice as strong as expected, and crazy process for generating auroras, probably far different from Earth’s. And if there’s someone who knows about Juno’s technological improvements, it’s Bill Kurth from the University of Iowa. He studied radio waves with the Voyager mission almost forty years ago, and is now working on radio wave and plasma observations for Juno. The new instruments have allowed Kurth and other radio scientists to do something Voyager scientists couldn’t—fly right through some of the solar system’s most intense radio emissions, emanating from Jupiter. “I think the Voyager program enabled us to write down the questions that we could answer with these followup missions,” said Kurth. Mark Hofstadter, Planetary Scientist at NASA’s Jet Propulsion Laboratory in California, was only part of the proposal process and as a sort-of outside source felt these first results have been a “beautiful example of how science often works.” Theorists create all sorts of models to try to explain data, and scientists tend to favor the simplest ones. But those models often aren’t quite right. Now that observers have actually collected data, theorists need to go back and try to figure out what the heck is going on. Hofstadter was especially excited about weather patterns that seem to go deep down, several hundred kilometers below Jupiter’s surface. Sure, we see the raging storms on the surface, but there seems to be even more complexity beneath. Researchers didn’t seem to be too disappointed about the longer-than-expected orbits, either, since they give folks more time to do science, Randy Gladstone, another SwRI physicist, told Gizmodo. He did point out that the spacecraft’s new alignment will be tricky to deal with—it was supposed to orbit around the planet’s twilight region between dawn and dusk, but now experiences full sun and full dark time. That’s not the conditions the instruments were built to operate in. It will also be more difficult to deal with the increased exposure to sunlight while trying to look at the planet’s aurora. If you’re excited about Juno, you can help vote on where the visible light JunoCam should point during perijove. After new images are taken, they’re dropped online where folks with the right software can process them and make some pretty incredible pictures. And if you were wondering what the planet smelled like, “it would have a stronger ammonia smell than Uranus or Neptune,” said Hofstadter. So, a lot more like pee than farts.